The japanese version features a different track on 1-2 (Ellen Allien instead of Swayzak) and a different version of track 2-11 ("exclusive to you people in Japan"). Deep IDM from Apparat, both doing remix duties and getting himself remixed. Swayzak’s dancefloor sensibilities get a click and cut treatment in “Smile and Receive,” and Boyznoize receive an electro-flavored mix of “Shine Shine.” He gets a hand from Ellen Allien for a dark mix of Paul Kalkbrenner’s “Queer Fellow,” while Raz Ohara has the gentleness of “Where He At” echoed in a slow and thoughtful mix that explodes with sound 2/3s of the way through. The female vocals on Nitrada’s “Fading Away” receive a backdrop of clattering percussion. But it’s his mix of Lusine’s “Drift” that stands out the most, a stuttering melody that gives way to long, modulated synths. 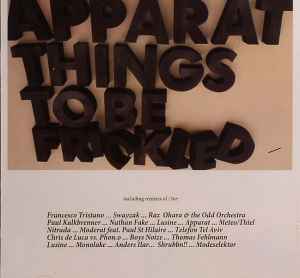 But Apparat (oftentimes accompanied by Raz Ohara) receive as good as they get: Telefon Tel Aviv get their hands on two tracks, “Komponent” and “Arcadia,” and work their considerable mellow magic on the former and go to the dancefloor with the latter. Meanwhile, Chris de Luca and Phono get groovy with “Holdon” while Modeselektor gives the track an acid flashback. Boyznoize return the favor on “Arcadia” with an almost ambient mix, punctuated with acoustic guitar and Rhodes chords. Monolake take “Steinholz” on a deep and abstract journey, and Anders Ilar gets even more blissful with “Wooden.” After repeated listens, I’d say Apparat frickles well, in addition to being well-frickled.